LucianAurora Cattery | Cattery of Siberian & Neva masquerade cats in Russia, Kazan. Welcome to LUCIANAURORA, small family run cattery located in Kazan, Russia. My name is Svetlana and I’m driving force behind the cattery. We are registered with the World Cat Federation, Germany (WCF) and International Cat Union, Russia (ICU). LUCIANAURORA was founded in 2014 and was named after my foundation cat. Our life, heart and soul belongs to siberians & I’m proud to tell that LUCIANAURORA is a homecattery of the BEST SIBERIAN CAT in Russia and the BEST NEVA CAT in the World in 2018*! 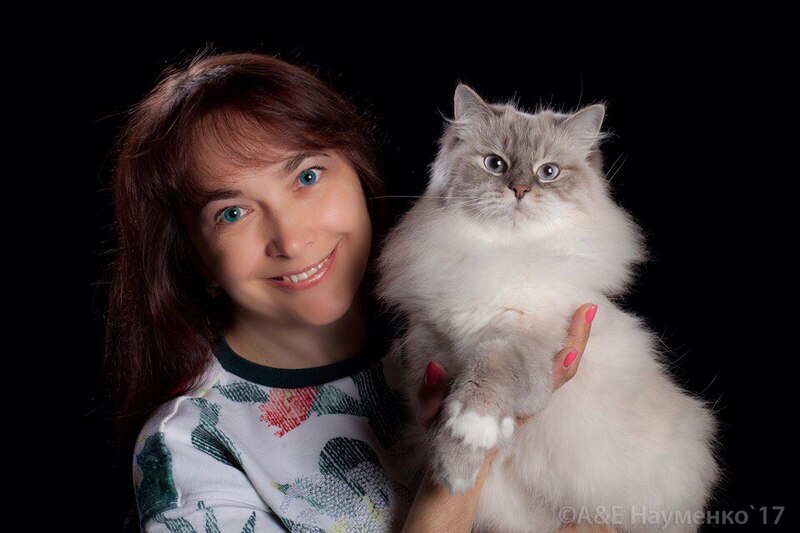 We engaged in breeding to improve the breed type of siberians and strive to produce cats with the deepest blue eyes; heavy bones; chic collars, trousers, and tails; very light-colored coats; and the most affectionate character! Our graduates live in respected catteries throughout the world — USA, France, Germany, Italy and many other countries! We keep in touch with all our graduates and proud to provide continued support after the purchase of my siberians. The quality of our cats and graduates is confirmed by highly respected judges through the titles and constant wins at international and world shows in Russia and other countries of the world; and ultimately their remarkable offspring. Cats of our cattery decorate pages of annual catalogs, a variety of calendars, newspapers, magazines. We enjoy collaborating with brands and being ambassadors. We are engaged in constant upgrading of qualifications at various courses, too. Enjoy your visit on our website and if you still have questions, please don’t hesitate to email us any time! Our cats live freely with us in our home as part of our family, in love and care. Every puppy that is raised in our home, we love from first breath. Our puppies are well socialized to all kinds of sights and sounds to make sure you have a well adjusted family member. We feed our cats a superior, premium cat food and natural foods. In this way, we succeed in raising the most lovable siberians with a calm temperament, non-aggressive behavior, and a nature for cuddling with you! Our cats have their own toys and sports complexes to aid in their harmonious physical development. Our top priority is health — our cats are tested for blood type, genetic diseases of the kidney (PKD), genetic diseases of the heart (HCM), as well as for viral diseases such as viral immunodeficiency (FIV), feline leukemia (FeLV), coronavirus (FeCoV), and others. All kittens move to a new family with age-appropriate vaccinations, microchip, a full package of documents (pedigree, veterinary certificate, certificate of chipping, and contract), and a knowledge of the rules of etiquette. If you are interested in a kitten from us, you can ask to be placed on our waiting list. We don’t allow our offspring kittens to live in a home where they will be caged. Please, don’t forget to write some information about you, your family, and your cattery. Pictures are also welcome because it’s important for me to know where my graduate will live. Our focus isn’t on quantity, but on the quality of our animals. Our goal — to bring forth the best!